Nottingham Trent University welcomed the Rt Hon Greg Clark MP, Minister for Cities, Universities and Skills to its city site to demonstrate the latest research and technology being developed. It was a pleasure to welcome the Minister to Nottingham Trent University. 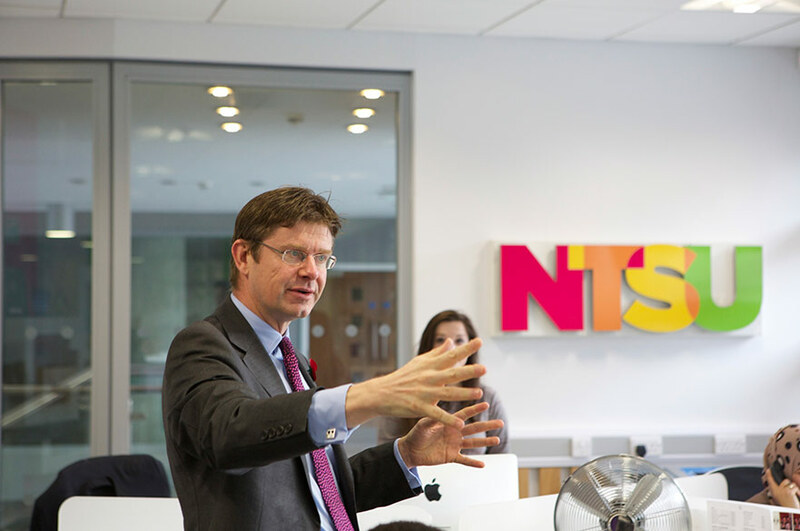 Nottingham Trent University welcomed the Rt Hon Greg Clark MP, Minister for Cities, Universities and Skills to its City site today to demonstrate the latest research and technology being developed. Vice-Chancellor Professor Edward Peck introduced the Minister to members of the University's executive team before taking him on a brief tour of the campus. Professor Benachir Medjdoub showed Mr Clark around the University's virtual reality lab, created as a research centre in digital art and design, where architects, artists, designers, engineers, computer scientists and human scientists collaborate to explore the potential of new visualisation techniques and digital design models and processes. The Minister also met Professor Tilak Dias, whose work at Nottingham Trent University focuses on embedding electronic sensors into yarn to create wearable technology, and who has also been involved in developing electronic textiles for the automotive industry, electrically heated gloves, textile sensors for stroke rehabilitation and textile electrodes for ECG measurement. Professor Peck said: "It was a pleasure to welcome the Minister to Nottingham Trent University and colleagues and I had a number of very constructive conversations with him about the achievements and plans of the University, and higher education more broadly." Marcus Boswell, President of Nottingham Trent Students' Union, also gave the Minister a brief tour of the Students' Union building in Shakespeare Street, where he learned about student facilities on the site. Mr Boswell said: "Students at Nottingham Trent were involved in the entire process of the new Students' Union build so that all of the facilities incorporated into its design were relevant to our members. "This allows us to showcase how any form of successful collaboration between Union and University exemplifies life at Trent: students having a say in their own experience."